Popcorn is one of my favorite snacks. 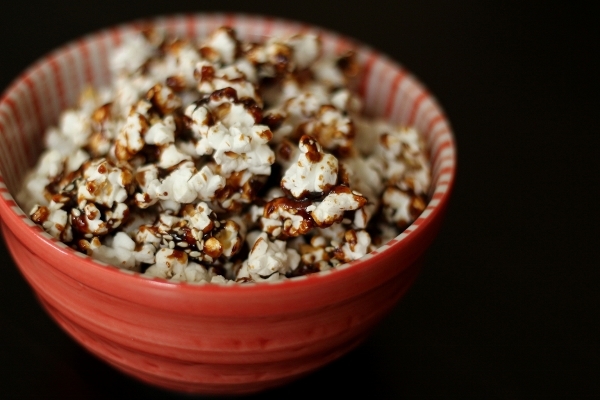 Whether it's plain air-popped corn, coated in rich butter and spices, or sugary-sweet. 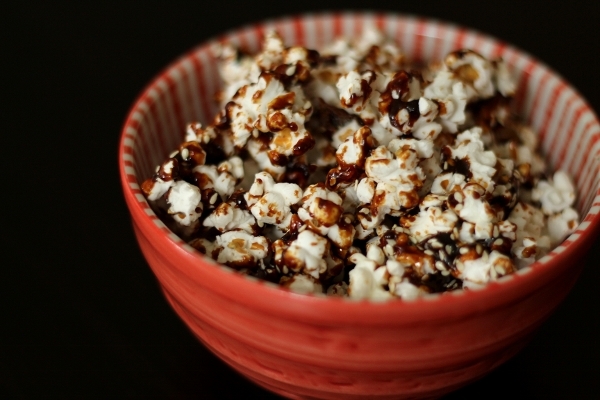 Although I usually go the savory route, I recently decided to make some dessert popcorn for movie night with a friend. Making caramel can be both fun and terrifying. It really helps to have a candy thermometer. My first couple times making caramel years ago, I didn't have a thermometer and successfully burned every batch. It just helps keep you in check :) Also, cooked sugar can basically melt your skin off. Don't touch it. Just don't. In this case, making a caramel with maple syrup (the real stuff) and brown sugar is a bit different from traditional caramel. 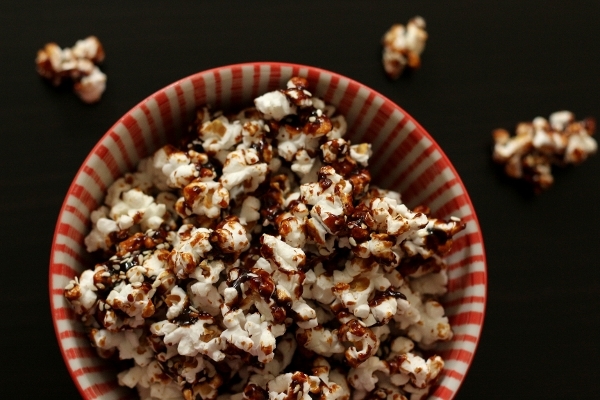 It finishes darker than a traditional caramel, and cooks to the soft crack stage (so it can form a crunchy coating on your popcorn). It's quite delicious and has a nice maple flavor compared to traditional caramel. I also liked that this recipe only uses 1 tablespoon butter. Most caramel uses a lot more, and although this is not a low-calorie snack (it's pretty high in sugar, let's not kid ourselves), at least it's not high in fat too! There's your silver lining. Enjoy! Preheat the oven to 250 degrees F. Lightly grease 2 large cookie sheets with a little butter. Place popcorn in a large bowl and keep warm in the oven. Place the sesame seeds in a small dish. In a large pan, over gentle heat, warm the maple syrup, brown sugar, and cinnamon, stirring frequently. When the sugar has dissolved, increase the heat to medium-high and bring to a boil. Boil until the syrup reaches a temperature of 250 degrees F on a candy thermometer. 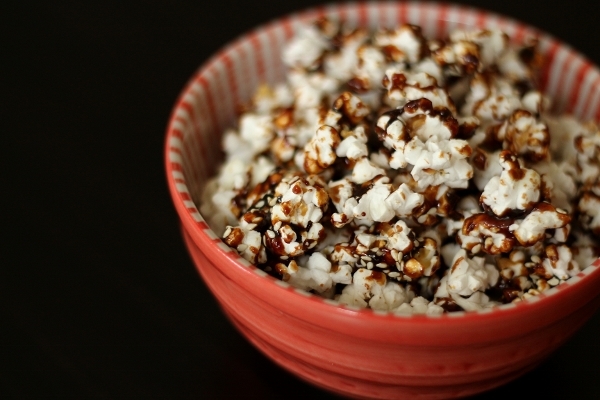 Stir in 1 tablespoon of butter and cook until the temperature reaches 280 degrees F.
Remove the popcorn from the oven. 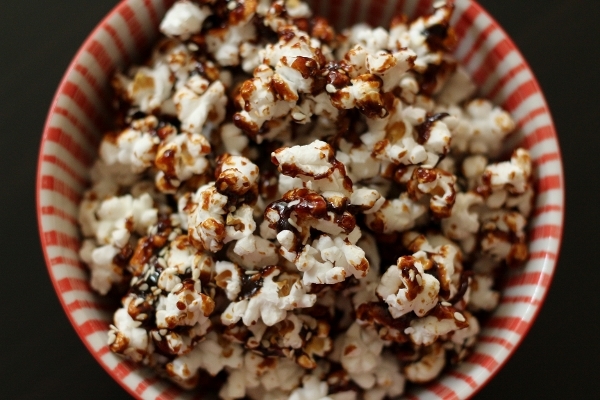 Quickly pour on half the syrup, sprinkle with half the sesame seeds, and mix to coat the popcorn evenly. Sprinkle on the other half of the sesame seeds and pour on the other half of the syrup. Stir again to combine. If the popcorn mixture hardens too much to mix, set it back in the oven for a couple minutes until softened. Transfer to the greased cookie sheets and set aside to cool before serving. 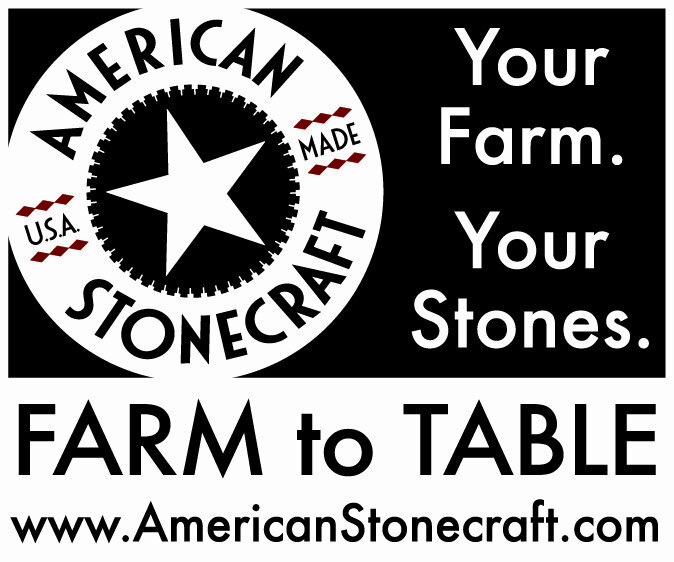 Can be stored for up to 1 week.